The Kingston SSDNow V-series has always been designed for ease of use and simplicity. Many consumers do not need a high dollar flagship SSD that brings a high price point along with the high performance. Many users have relatively light workloads that consist of email, internet browsing and heavy multimedia use. This type of usage pattern does not require the highest speed that money can buy, and for most common users the real decision comes down to price and reliability. Kingston’s value oriented SSD is wading into tough waters with the TLC NAND Samsung 840, providing a great solution in the ‘bang for the buck’ category. I am not going here to review this drive, because the web is full of experts’ reviews, rather I will lay out the conclusions of their reviews to make it easy for readers to have an essential cognition on this product. [*] Great price/performance ratio. Priced well below $1 per GB. [*] Older SF-2181 loses speed in random read/writes, or when working with uncompressed data. Kingston’s V-series SSDs have a long history of offering competitively priced solutions which tend to punch above their weight class on the performance front. This has endeared them to enthusiasts and novices alike since relatively low pricing and outstanding real-world results is an enticing combination for pretty much everyone. The V300 is the latest iteration of this storied line and like its predecessors, this SSD provides nearly everything we could want from a budget-friendly storage solution. With the V300, Kingston needed to outperform the competition without stepping on the toes of its bigger brother, the HyperX series. Threading this needle wasn’t easy but the newest addition to the SSDNow family accomplishes everything it set out to do without alienating anyone. The V300 provides excellent value, reasonable performance, easy to use data migration software and a great warranty, making this one of the most accessible SSDs currently available. For the capacities of 60GB and 120GB Kingston has managed to deliver a value-oriented SSD that will hold the TLC NAND sharks at bay. The test pool that we placed the 120GB Kingston SSDNow V300 into was definitely weighted against this value offering, yet it managed to come up with some respectable performance, more than enough for a typical consumer. With a lower cost, higher performance and higher endurance than competing TLC products of the same capacity Kingston has found a nice niche for the V300 series of SSDs. Kingston has a solid reputation among enthusiasts and a decent 3 year warranty on the drives which feature the proven LSI SandForce SF-2281 controller in conjunction with 19nm Toshiba Toggle NAND. Taking into consideration the low prices for standard higher-endurance MLC (in relation to TLC products) at the 60 and 120GB capacity, and great overall performance, we give the Kingston SSDNow V300 the [H]ard|OCP Silver Award. The Kingston SSDNow V300 is an excellent choice for the cost-conscious consumer looking to upgrade their existing desktop or notebook PC. This new solid state drive combines LSI’s SandForce SF-2281 controller with Toshiba’s 19nm MLC Toggle Mode NAND flash to deliver some surprisingly good performance. While rated at only 450 MB/s, the 120GB V300 was able to read at speeds as high as 585 MB/s and write at speeds in excess of 500 MB/s. It also exceeded expectations in our random write tests, delivering more than 80,000 IOPS at low queue depths. Impressive performance isn’t the only thing the V300 has to offer either. Along with a good looking, well constructed design, the SSD is available as a standalone drive or as part of an upgrade kit containing cloning software and other accessories for a desktop and/or notebook system. All in all, kudos to Kingston and LSI SandForce for the great new SSD introduction and we are happy to award our Innovation Award to the SSDNow V300. [*] The SSD is of a magnitude faster generally than the mechanical hard drive in almost every way. Windows startup is blazing fast and shutdown is noticeably quicker! 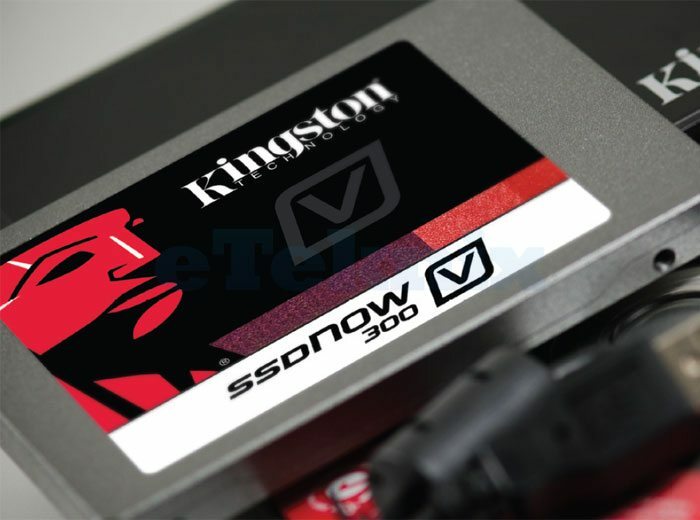 [*] Kingston’s SSDNow V300 120GB drive has improved over the previous V200 series with a new custom controller and memory that brings it up to near HyperX performance. [*] TRIM support and garbage collection keeps your drive “like new”. The SSDNow 300 SSDs also offer advanced wear-leveling technology, S.M.A.R.T. tools and DuraClass Technology. [*] Excellent bundle for notebook or desktop in a single package makes setting up your SSD a breeze and well worth the ten dollars more over the standalone drive . However, standalone offers a good option for those who already have the cloning SW and HW. [*] Price per GB is still high compared to mechanical hard drives. [*] The 120GB Kingston SSDNow 300 deserves the ABT Great Value award. It is a good drive for gamers who don’t mind its limited capacity, there is plenty of room for Windows, applications and perhaps five or more of your favorite games. It is also highly recommended as a time and frustration saver in starting up and shutting down Windows and for anything to do with file access, copying, or loading game levels. Kingston is offering up the SSDNOW V300 120GB as a “Value Drive” and as such the V300 is has one of the best prices in its class. The V300 however is one of those rare drives that outclass the rest of the class because; it’s actually more of a performance drive with a value pricing. The drives quality is outstanding and all components used are top quality. There is no crappy Asynchronous NAND in this baby as we so often see in a “Value” oriented drive. Toshiba’s 19nm Synchronous NAND Flash offers a rare combination of performance and low cost making it the ideal choice for the V300. Kingston did a great job with the V300 and it’s a drive we have no reservations what so ever in recommending you own.